LEGAZPI CITY (Jan 5) – Repair of Doppler radar (S-band/Solid State Meteorological RADAR) is undergoing major repair after it was slammed by Typhoon Nina, said PAGASA Deputy Director for Operations and Services Landrico Dalida, Jr. In an interview with Dalida by DZGB News Friday, the repair of the building is expected to be finished by February this year while the repair of the Virac Doppler Radar stationed in Bato, Catanduanes is expected to be operational by last week of April 2018 with the Japanese experts manning the repair. He said that the Doppler radar is very essential in detecting the amount of rainfall or volume of water because it is seen in the radar. The utilization of the Doppler radar will help in mitigating the destruction caused by tropical cyclones and other severe weather occurrences. 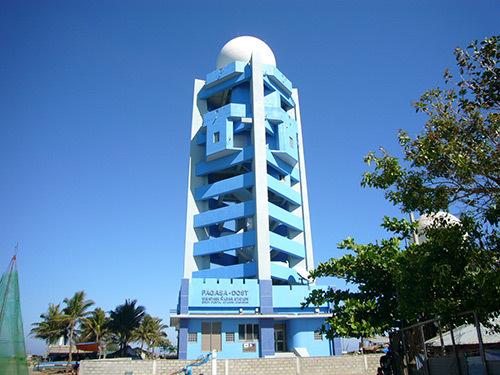 The equipment will enable PAGASA to conduct more extensive weather monitoring such as detecting the direction of rainfall motion. The technology will also allow PAGASA to issue an hourly public storm signal warning and tropical cyclone information to agencies concerned and improve accuracy of flood forecasts and warnings. The radar facility can also transmit information real-time for faster, more regular, and more precise forecasts - which the weather bureau has been trying to improve after getting flak for inaccurate and slow forecast announcements in the past. "This will give us more information and will help us predict more accurately the direction, the impact, and the intensity of weather disturbances approaching our country”, Dalida added. He also lamented on the hip-to-neck deep floods that hit Legazpi City the other day due to the non-operational Doppler radar that could give vital data for decision making. Though PAGASA Regional Forecasting Service in Legazpi have issued yellow and red rainfall warning but it is not sufficient.